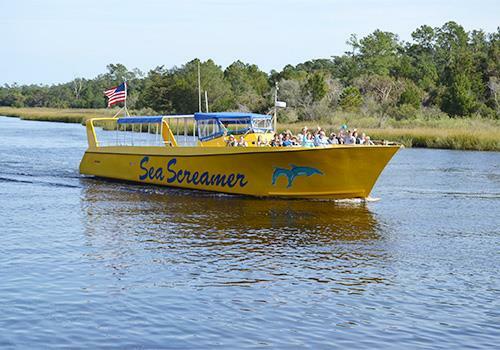 Climb aboard the Sea Screamer and get ready to jet off on the greatest dolphin cruise around. 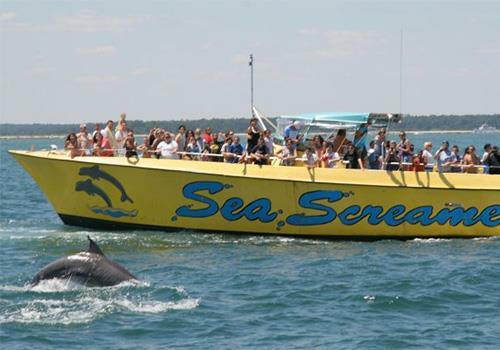 Be prepared to get wet as the Sea Screamer cruises by several uninhabited islands on the trek to find dolphins. Don’t forget your camera—you’ll want it when you sail by the coastline as you return to shore. 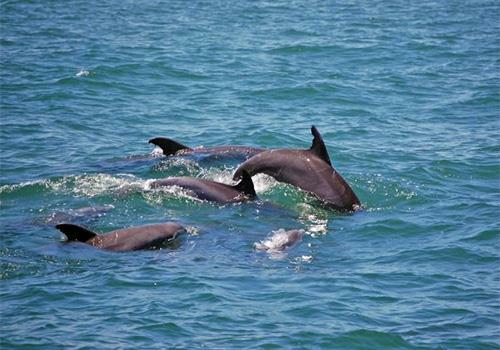 Keep an eye out for playful dolphins throughout the cruise. You never know where one will appear! 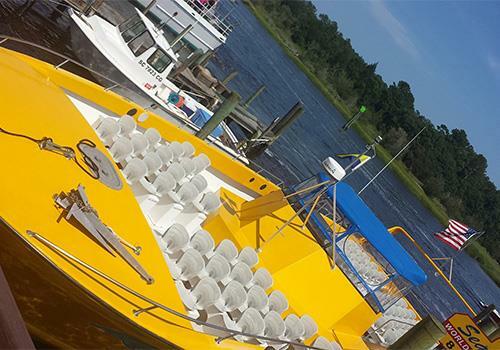 The Sea Screamer holds approximately 141 passengers. If you want SEATING UNDER THE CANOPY please arrive early because boarding is done by group #. 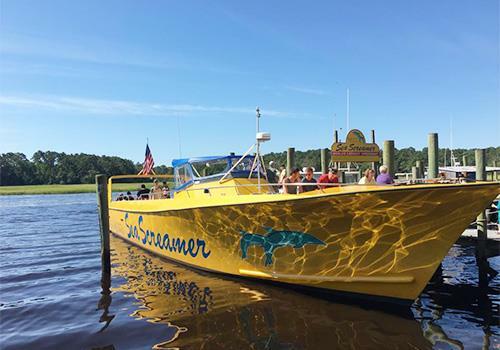 Group #1 will board first and will include several parties who arrive the earliest. Check in is inside the Captain Juel’s Hurricane Restaurant and is 45 to 30 minutes before boat departs. All passengers must check in and get a boarding pass before boarding. 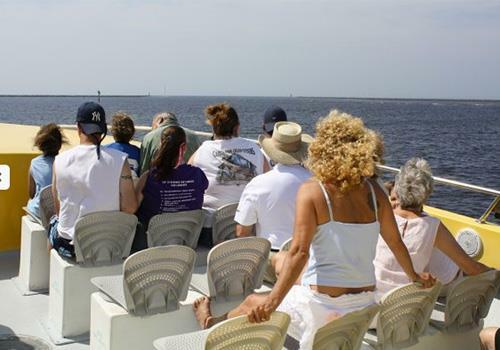 The boat departs promptly at scheduled times so please allow time to park, check-in, etc. PARKING is half way down Mineola Ave on the left hand side. Look for the Sea Screamer parking sign. Walk towards the waterfront to the Captain Jules Hurricane Restaurant and enter the Restaurant for check-in. Yes. Parking is half way down Mineola Ave on the left-hand side. Look for the Sea Screamer parking sign. Yes. 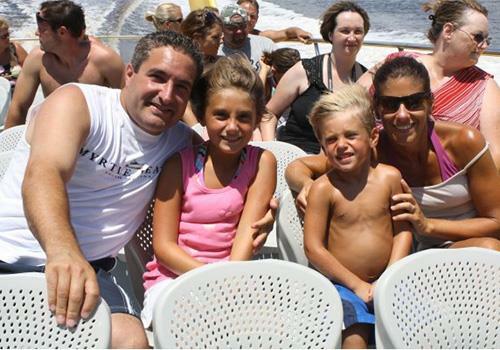 In the case that your cruise is canceled due to extreme weather, please follow instructions given by the crew and staff.